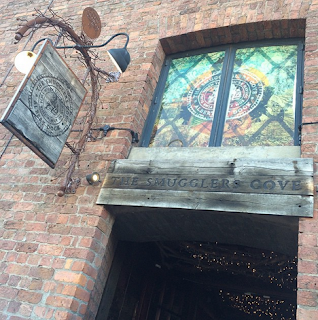 Back in June, a bunch of us bloggers went for food and cocktails at The Smuggler's Cove in Liverpool, in collaboration with Satander and their new KiTTi app. The app is basically the mobile version of a good old fashioned kitty - a way to collect money within a group for you all to spend on a night out, holiday, shopping trip or whatever you choose! It was a typical Scousers night out; we met at the L1 steps and wandered over to the Albert Dock, where we had a table booked at the Smuggler's Cove. Inside it's absolutely beautiful, with light fittings made from armour helmets, rope and stools and pirate memorabilia everywhere. The food is well priced and utterly delicious; I went for onion rings as a starter followed by the deli board for my main course - I'm salivating at the thought! And the cocktails, ohhhh the cocktails. They're mostly rum-based, obviously, and they're super strong but I wouldn't have it any other way! The KiTTi app was so easy to use: the lovely Jem was put in charge of our's, and she invited each of us to join our group on the app. We then deposited money from our bank accounts, and it showed in the little jar - easy as pie. Jem was then sent a special debit card which was used to pay at the end of our night - et voila! The lovely people over at Talented Talkers, who had set up the night for us, doubled our total and added that to the KiTTi too, meaning for the £15 I put in, I had £45 to spend. Bonusssss! It was such a lovely night, so I'd like to say a massive thank you to Talented Talkers, Santander and of course my gorgeous fellow bloggers for making me laugh til my belly hurt. I can't wait to see you all again girls! This sounds like such a fun night out, and the app is such a clever idea. 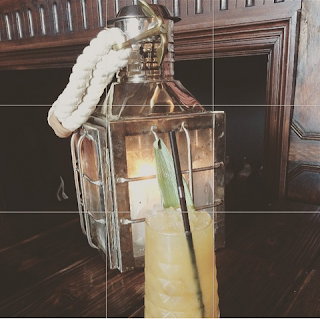 Oh, and a restaurant which specialises in rum cocktails? It sounds right up my street! Love the idea of this app! Makes saving up and splitting bills super easy!